My ouya was working, but after an update I get a power light and nothing on the screen. I think my Ouya is bricked! Sometimes this happens if there is cache files that is preventing your Ouya to power up all the way with the newly updated OS. To resolve this you will need a USB keyboard plugged into the back of your Ouya. Let it boot up as far as it can. hold the Alt and PrtScn/SysRq and finally the I button on your keyboard. While holding the Alt and PrtScn/SysRq buttons down press the I key continuously. Just as a note since you will be unable to see anything on the screen as you are doing this it may take a few tries to accomplish this. If your monitor is reading a signal and the screen is simply blank. press the Home key and you should see the Ouya recovery screen. 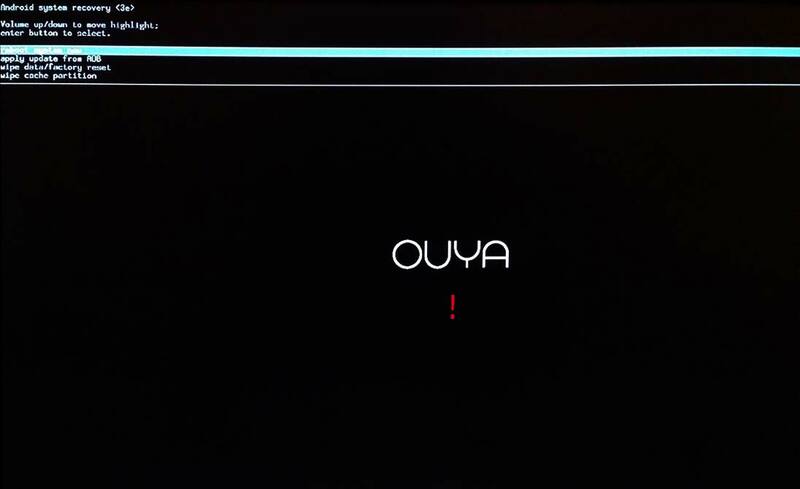 Eventually, you can bring the Ouya into Recovery Mode which will be the Ouya logo with a red exclamation mark. From there you can wipe the cache partition and perform a data/factory reset. Reboot the Ouya and it will return to it’s factory state. This blog entry is apart of the Ouya Support and Troubleshooting guide assembled by S click on the picture above to go to that entry.